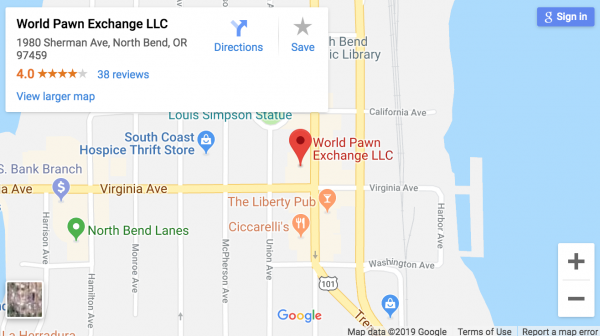 World Pawn Exchange – the Best Pawn Shop Around! Come and see us to buy sell and trade. We deal in jewelry, guns, gold, silver, coins, electronics, video games, tools and much more! We are always getting new inventory, as we are constantly buying things, and other things are coming off of pawn! Feel free to give us a call if you are looking for something specific. We loan money on your items, so you can have some extra cash when you need it. We have helped thousands of customers over the years. We would love to earn your business! Want to know more about loans and what we take? Check this out. We have the BEST selection of jewelry in our area. There isn’t one store around that can compare to our selection, or our prices. We have gold jewelry as well as silver jewelry. We have a fantastic selection of diamond engagement rings! If you are thinking of buying some new jewelry, come see us first! Want to know more? We have easily over 100 firearms out for sale. We have a wide range of brands and models. Some are new, and some are used. We probably have something you would like, so just come and see our selection! It changes every day, literally. Here is a little more info. Have you seen our Guitars? We have a great selection of guitars. We have bass guitars, electric guitars, and acoustic guitars. We also have a lot of guitar amps! In fact, we have a ton of musical equipment in general. Microphones, mixers, speakers, cords, and more. We also generally will have saxophones, flutes, clarinets, trumpets, and sometimes violins. Our loans are 60 days long, and they come with a 30 day grace period on new loans. If you bring in a TV and get a loan today, you will get 90 days total. When you renew a loan, you do not get another 30 day grace period. My loan is due, can I get more time? Yes, you can renew the loan by paying the finance charges due. When you renew your loan, you will get 60 more days. You can do this as many times as you need to. It depends on the item. Some things are easy to liquidate, so we can pay more. We pay top dollar for gold, silver, diamonds, jewelry, name brand tools, and name brand electronics. Collectible items, especially larger ones, are hard to sell. If you would like a quote on your item, you can call us, message us on Facebook, or just come in to see us. Can someone else pick up my pawn? Someone could pick up your pawn if they had your ticket. If you lose your ticket, call us and we will put a note in the system to require ID match to pick up the item. If I default on my loan, will it hurt my credit score? No, we don’t report to any credit agencies. If you default on a loan, it will have no negative impact for you. We do like when our customers are able to get their items back, so if you need a day or two, give us a call before the due date and we will generally be able to help you.